Natural resources define everything about a place in early American history. Gold was typically the most important resource explorers were in search of, but local panaceas, the elixir of life, the philosopher’s stones, and other miraculous findings were also important findings for many regions. In New Spain the panacea for the age was Sassafras, a cure for lues venera (usually syphilis), in New France Chamaecyparis was the Tree-of-Life for Jacques Cartier. New Spain, New Netherlands and New Sweden had their own miraculous cures from nature, but non of these compared to the many more cures being discovered on a single plot of land by the time entrepreneurs like Samuel and John Watkins took the opportunity to lay claim to and settle the many places left unclaimed by early explorers. This practice defined the first changes that took place once on the North American continent once the United States was formed. Numerous investors were ready to make whatever payments were needed to obtain ownership of the unsettled portions of a new country. They did everything possible to find the best of these unexplored territories, but often simply stood in line in order to lay claim to the next tract west of military and governmental lands that became available. The entrepreneurial establishment set up by Watkins and Flint became central to the movement required for western New York to become settled between 1790 and 1795. Watkins had important exposure to another family that excelled in the skill of settling unclaimed territories. John Watkins married into the Livingston family. The Livingstons did much to help him secure his route to fame first as an investor and second as a younger natural resource explorer with the innovation and imagination of one of his relatives, Robert Livingston. The Livingstons invented numerous uses for the abundant supplies that nature provided. In the Hudson Valley, they led to the first complete deforestation of the Columbia County area for its lumber, tanning bark, and “naval stores” (pine resin used to seal boats). Following the Union of the States, this same land was used to find the products needed to produce everything from paper and ink, to clothing, weaponry, and tools. Further west, similar resources were found south of the Finger Lakes region by John Watkins. In particular, the region at southern tip of Lake Seneca where the remains of former Indian Settlements resided, according to Watkins, was rich in yet-to-be discovered resources. The most important feature to understanding a region according to the Livingstons and Watkins was knowing the climate and seasonal wind patterns. For the pioneer settlers of western New York, the most important feature was to be able to farm these lands and survive the very cold winters. This ongoing problem the pioneers would have with wetern New York helped to define the most stable crops to be grown in this region. 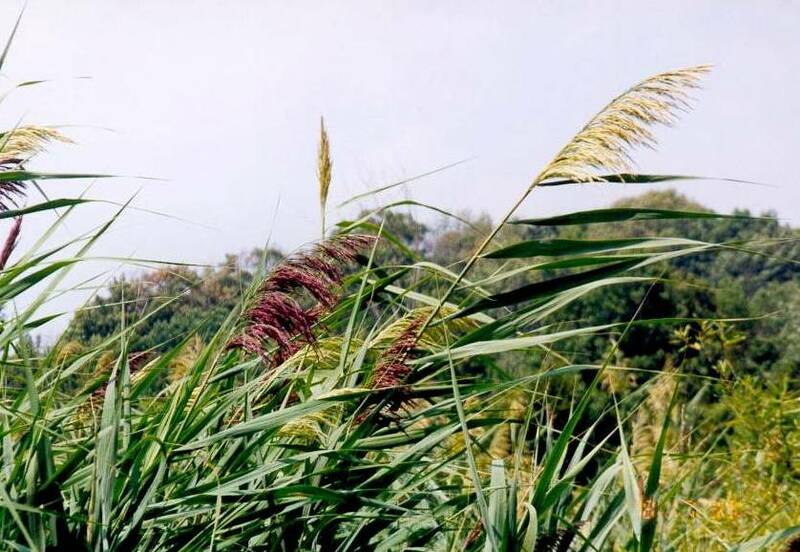 All of the plants Watkins covered in this article are of some economic importance, ranging from natural forage species to natural products sources for the production of wood, cordage, fibers, productive crop fields and medicine. Whereas earlier attempts to document the use of natural resources was somewhat piecemeal in its planning and publication of reports, with a focus mostly on products like lumber and cordage, the reduced amounts of these major forest products in western New York led the Livingstons and Watkins to search for other potential industries. As a result, what little existed of the forest settings in this part of western New York very quickly became a scarcity, replaced by heavily farmed fields and the rolling hills of numerous orchards. 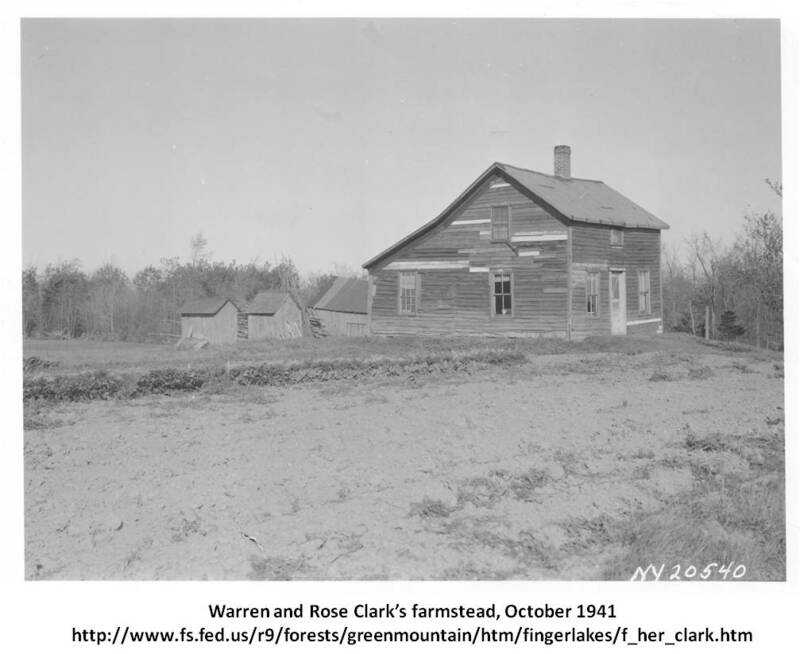 The establishment of self-sustaining homesteads and the knowledge of the local ethnobotany and geological resources were the resources of choice for those devoted to exploring and monopolizing on the natural products of the Allegheny Plateau and western New York growing fields. Watkin’s land resided at the south end of what later came to be known as the finger lakes. 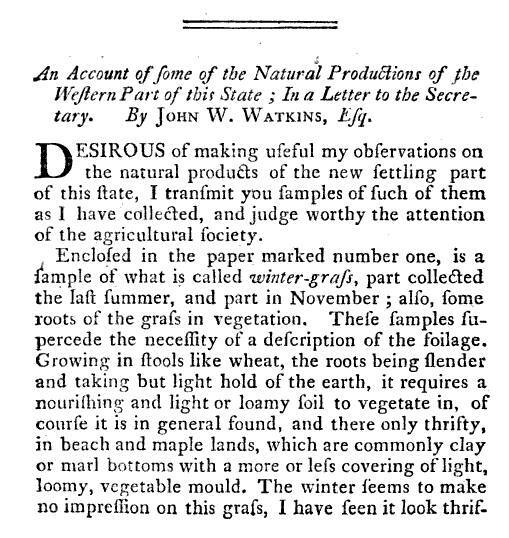 Watkin’s work is probably the first to document native American botany for this small region for several or more plants. 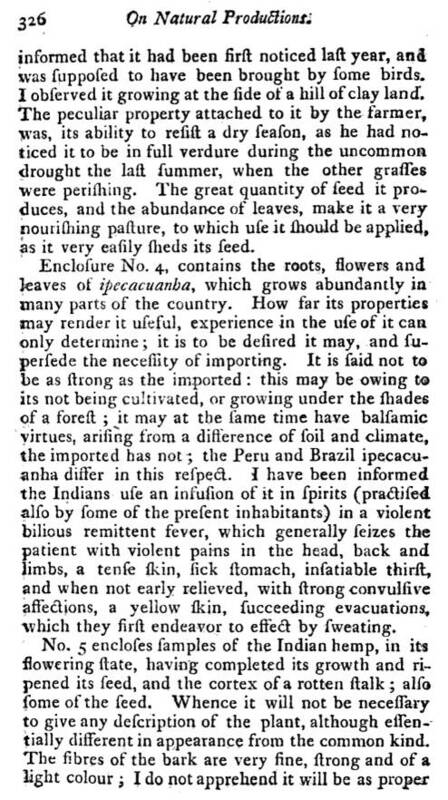 Plants which were previously introduced to New Yorkers during the Colonial Years, were by now more important to understand and very important to learn to incorporate into our way of life. Medicine by now was very much a natural ecological event, with disease often a result of the local economy and local ecology and landforms. 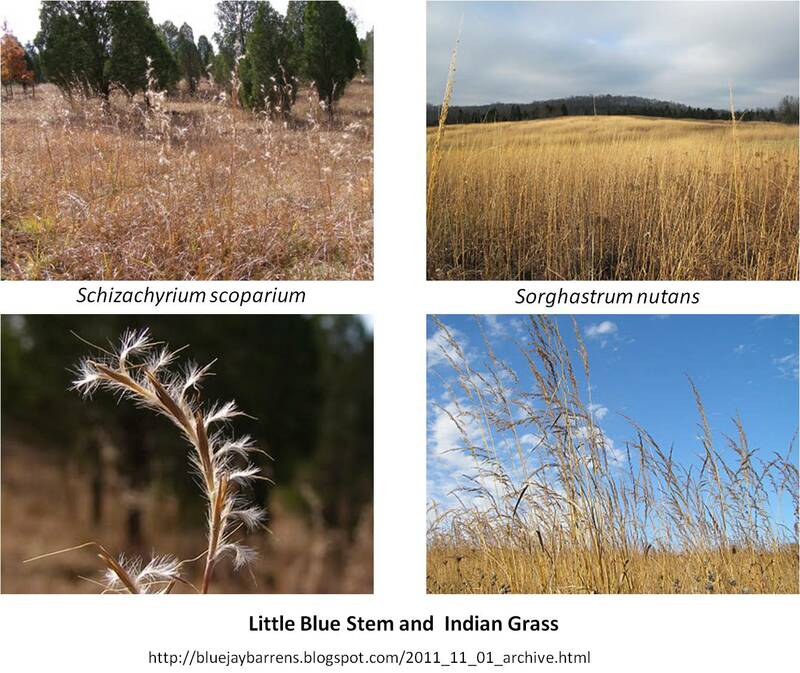 In a natural historian’s pastoral way of thinking for the time, these plant symbolize the ability of lands to produce adequate animal and human food sources in spite of their much colder winters. The grass and legume (wild pea) represent domesticated animal feed. 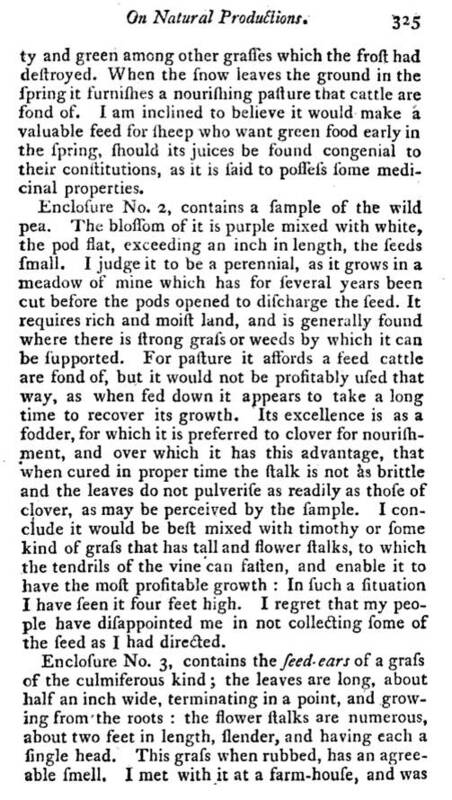 The wild pea, ipecac and hemp plant symbolize the ability of future settlers to fulfill any basic survival and subsistence needs they might have, such as the need to grow their own fruit and vegetable food sources, medicines and fiber products, in a region that at the time was rarely travelled by supply wagons throughout most of the year. This is a very brief list of important ethnobotanical plants, but it represents one of the first deliberate attempts made by investors to take advantage of these natural resources with serious hopes for fruition. 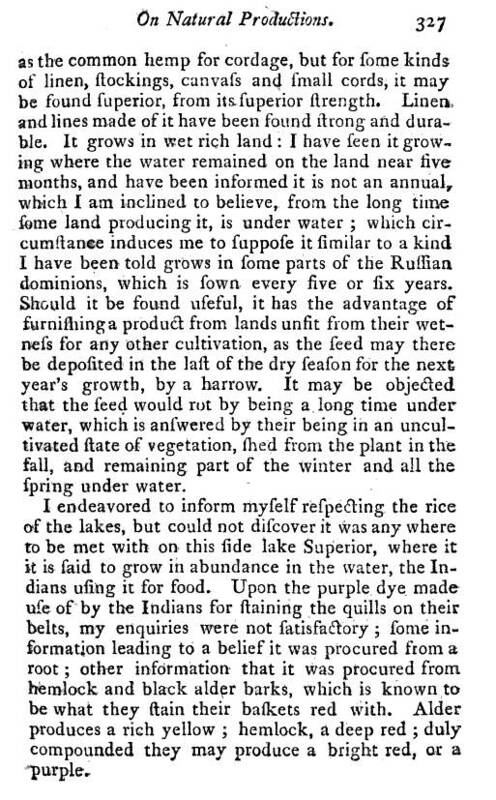 John Watkins also mentions “the rice of the lakes” and then goes into a short section on dye plants, namely “the purple dye made use of by the Indians for staining the quills of their belts”, and “hemlock and black alder trees which they stain their baskets red with”. The meaning of possessing and living on new lands was now quite apparent to the rest of the country back east, in communities well established along the Atlantic shoreline. This is the earliest period in which Americans make aggressive attempts to “colonize” the interior of the continent. French, English, Connecticut, Vermont and Massachusetts families and investors were laying claim to various part of the country that would later become New York. Now it was New York’s turn to define its true boundaries. The Livingstons and Watkins did much to turn scholars attention to better understanding the landschaft of western New York. A better understanding of topography and climate were necessary for these explorers to understand the true value of their newest supply of natural resources, enabling new communities to be established and new industries to be developed, the completion of step 2 in land use development according to Benjamin Rush’s interpretation of human settlement patterns. A change from Stage 1 to Stage 2 settlement patterns according to the more modern take on this Sequent Occupancy theory.